Big Issue, The (UK) - Campaigns on behalf of homeless people and highlights the major social issues of the day. It allows homeless people to voice their views and opinions. Building Opportunities for Self-Sufficiency (BOSS) - Strategies of economic development, community building, housing, and support. BOSS program participants are 100% poor, 70% homeless, 30% housed. They are all races, ages, backgrounds, and life experiences. Cal-Earth Institute - Designs low cost housing using earth construction techniques and long sandbag Superadobe technology for third world developing countries lunar and martian applications. California Housing Law Project (CHLP) - Advocacy organization lobbying in the California State Legislature for affordable housing and tenants rights for low income people, the disabled, elderly, homeless and farmworkers. 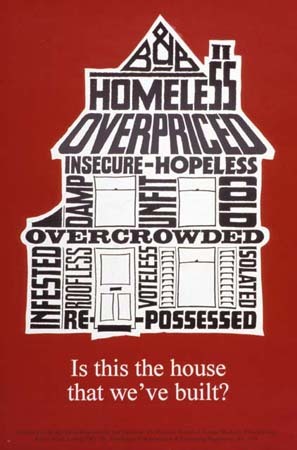 Centre on Housing Rights and Evictions (COHRE) - Housing rights activisim. Chicago Anti-Eviction Campaign - Seeks to enforce human right to housing by fighting to stop all economically-motivated evictions in Chicago. No longer willing to wait for any authority to recognize the human right to housing. City Life/Vida Urbana - A grassroots community organization committed to fighting for racial, social, economic justice and gender equality by building working class power through direct action, coalition building, education and advocacy. Coalition on Homelessness, San Francisco - COH was organized in 1987 to garner the active participation of poor people on both the design and critique of public policy and non-profit services that result in permanent solutions to poverty. It is a unique organization in that the driving force is low income and homeless people, working in every aspect of the organization, from the volunteers to the staff and leadership body. Fair Share Housing Center - Public interest organization defending the housing rights of New Jersey's poor through enforcement of the Mount Laurel Doctrine, the landmark decision that prohibits economic discrimination through exclusionary zoning and requires all towns to provide their 'fair share' of their region's need for affordable housing. Federal Housing Finance Agency (FHFA) - FHFA's primary mission is ensuring the capital adequacy and financial safety and soundness of two government-sponsored enterprises (GSEs) - the Federal National Mortgage Association (Fannie Mae) and the Federal Home Loan Mortgage Corporation (Freddie Mac). Habitat for Humanity - A nonprofit, nondenominational Christian housing organization that welcomes all people to join them in building simple, decent, affordable houses in partnership with those in need of shelter. Since 1976, Habitat has built more than 100,000 houses in more than 60 countries, including some 30,000 houses across the U.S.
HomeAid - Building and renovating shelters for temporarily homeless men, women and children. Homeless - What would you do if you had no-where to live? No money and no help? This website is about how people survive without a home, money or support. Homeless Shelter Directory - Emergency shelters along with general homeless shelters and some transitional housing opportunities. Also now lists other homeless resources such as services and transitional resources for the homeless, medical and dental clinics for the homeless and low cost and free alcohol and drug treatment rehab centers. Hospitality House of Western Nevada County - A community shelter for the homeless. Housing America - Seeks to ensure safe and affordable housing for all Americans by mobilizing community groups, tenants, students, religious leaders, pediatricians, and other constituencies in campaigns for increased federal housing funds. Housing California - A statewide coalition of over 1,000 affordable housing and homeless organizations. Housing Trust Fund Project - Operates as a clearinghouse of information on housing trust funds throughout the country, and provides technical assistance to organizations and agencies working to create or implement these funds. Housing trust funds have demonstrated their ability to provide flexible funding for the preservation and development of affordable housing, as well as the ability to thrive throughout economic hardships and tough political climates. Local jurisdictions increasingly turn to housing trust funds as a key tool to meet their housing needs. Maintained by Center for Community of Change. Inside Housing (UK) - Social housing news and housing sector recruitment magazine. Institute for Children, Poverty, and Homelessness (ICPH) - Through the examination of empirical, quantifiable data, ICPH seeks to inform and enhance public policy related to homeless families, with an emphasis on the impact on children. Joint Center for Housing Studies, Harvard University (JCHS) - The Center publishes its signature report, The State of the Nation's Housing, which provides a widely-referenced annual assessment of housing markets, homeownership, and affordability challenges. Knowledgeplex - Resource for the affordable housing and community development provided by the Fannie Mae Foundation. Designed for practitioners, scholars, and policy makers. National Alliance to End Homelessness (NAEH) - A nonprofit organization whose mission is to mobilize the nonprofit, public and private sectors of society in an alliance to end homelessness. National Center on Family Homelessness - Conducts research, identifies and disseminates best practices and innovative solutions, and raises public awareness about the unique needs of homeless families. National Coalition for the Homeless (NCH) - A national advocacy network of homeless persons, activists, service providers, and others committed to ending homelessness through public education, policy advocacy, grassroots organizing, and technical assistance. National Housing Conference (NHC) - Dedicated to helping ensure safe, decent and affordable housing for all in America. NHC Open Housing Blog - Focuses on the most current and critical issues facing the housing and affordable housing community. National Housing Institute (NHI) - Examines issues causing the crisis in housing and community in America: housing and economic development, poverty and racism, disinvestment and lack of employment, and breakdown of the social fabric. Findings are communicated in an objective, journalistic style in Shelterforce, its bi-monthly magazine. National Housing Law Project - A national housing law and advocacy center. Provides legal assistance, advocacy advice and housing expertise to legal services and other attorneys, low-income housing advocacy groups, and others who serve the poor. National Law Center on Homelessness and Poverty (NLCHP) - Mission is to alleviate, ameliorate and end homelessness by serving as the legal arm of the nationwide movement to end homelessness. National Low Income Housing Coalition (NLIHIC) - Dedicated to ending America's affordable housing crisis. Provides up-to-date information, formulates policy, and educates the public on housing needs and strategies for solutions. NeighborWorks America - Financial support, technical assistance, training for community-based housing programs. Non-Profit Housing Association of Northern California (NPH) - NPH spurs citizen action and focuses government policy on housing solutions for low-income people who suffer disproportionately from the housing crisis. Pathways to Housing National - Working to transform lives by ending homelessness and supporting recovery for those with mental health challenges. Partnership for the Homeless - Founded nearly three decades ago to provide emergency shelter, the Partnership's work has expanded over the years to include an array of services for New Yorkers experiencing homelessness, at risk for homelessness, or who are rebuilding their lives after leaving shelters. Shelter (UK) - Help people in the UK fight for their rights, get back on their feet, and find and keep a home. Also tackles the root causes of Britain's housing crisis by campaigning for new laws, policies and solutions. Shelterforce - Shelterforce is the nation's oldest continually-published housing and community development magazine. For over two decades, Shelterforce has been a primary forum for organizers, activists, and advocates in the affordable housing and neighborhood revitalization movements. Also, see ifts blog: Rooflines. Squash - A network of groups and individuals who don't want to see squatting criminalised. Squatters Legal Network - A legal support network for squatters. State of the Nation's Housing 2013 - Report from Harvard University's Joint Center for Housing Studies: "The long-awaited housing recovery finally took hold in 2012, heralded by rising home prices and further rental market tightening. But even as the most glaring problems recede, millions of homeowners are delinquent on their mortgages or owe more than their homes are worth. Worse still, the number of households with severe housing cost burdens has set a new record." Street News Service - News, views and features from streetpapers across the United States and Canada. The Homeless Guy - Weblog by Kevin Michael Barbieux. U.S. Department of Housing and Urban Development (HUD) - U.S. agency responsible for increasing homeownership, supporting community development and increasing access to affordable housing free from discrimination. Also see HUDCLIPS, for access to HUD's official repository of policies, procedures, announcements, and other materials. U.S. Homeless Resources and Sleep Accomodations - A directory of homeless resources, including homeless shelters throughout the U.S.
Vancouver Renters Union - A vehicle for renters to collectively determine housing rights, rents, and stability through collective bargaining and political action, in Vancouver, British Columbia, Canada. Working Poor Families Project (WPFP) - A national initiative focused on state workforce development policies involving: 1) education and skills training for adults; 2) economic development; and 3) income and work supports. The WPFP supports state nonprofit groups to engage in a two-part, phased process that begins with an in-depth assessment of the economic conditions and state policies affecting working families and is followed by actions to strengthen those conditions and policies. This webpage last updated on Wednesday, January 9, 2019 9:14 AM.